Were the Long Island Chapter of the National Cartoonists Society. The Berndt Toast Gang started in 1966 when some L.I. cartoonists were working on an animation for Hanna Barbera. Named in honored of Walter Berndt, the creator of the long-running strip, Smitty. Weve been raising a Berndt Toast to past members at every lunch since. When Creig Flessel, Bill Lignante, Frank Springer, Al Micale, and I got together to work for Hanna Barbera in the 1960s, we decided to have a lunch at Finnegans Bar the last Thursday of every month. During that period, Creig brought Walter Berndt to join us. We fell in love with the cigar-smoking old-timer (look who's talking! ), as he did with us. After a couple of years he passed away and left us grieving. Thereafter, whenever we convened on Thursdays, we'd raise a toast to Walters memory. On one such, my big mouth opened and uttered, Fellas, its time for the Berndt toast! I wasnt trying to be cute at the time, but Im not displeased that it stuck and we became the Berndt Toast Gang, one of the largest branches of the National Cartoonists Society. We are a professional organization. Most of our members are full members of the National Cartoonists Society, some are also members of the Society of Illustrators. Aspiring cartoonists and members of related fields are welcome to join us at our monthly lunch. We do hope that members work towards becoming members of the National Cartoonists Society. If you are a cartoonist, illustrator, writer or from a related field and would like to join us at a monthly meeting, please e-mail Adrian C. Sinnott, our chapter chairperson. If you are an teacher and would like to have one of our members speak to your students, please click here to send an e-mail. If you represent are an art-related facility that would be interested in a gallery showing of the members work, please click here to send us an e-mail with details of your request. For the latest news from the Berndt Toast Gang, visit our Facebook page. Our members are proud to be a part of the Ink Well Foundation. The Ink Well Foundation is a 100% volunteer-run 501(c)3 non-profit organization of professional animators, illustrators, and cartoonists. 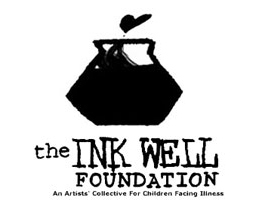 The Ink Well provides free arts activities and supplies to children facing illness or challenges such as foster care, abuse and neglect. Please consider making a donation to this very worthy cause. ©2018 The Berndt Toast Gang.